Today brings welcome news from Italy. 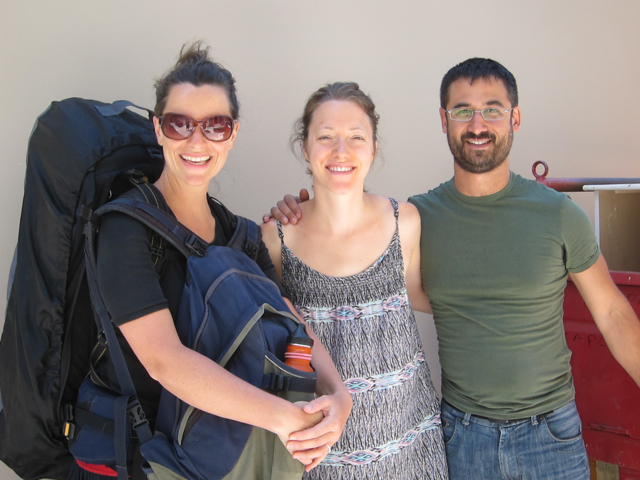 The very nature of our journey means that we are connecting with, working with and then inevitably parting way with friends, couch surf hosts and wwoof hosts along the way. 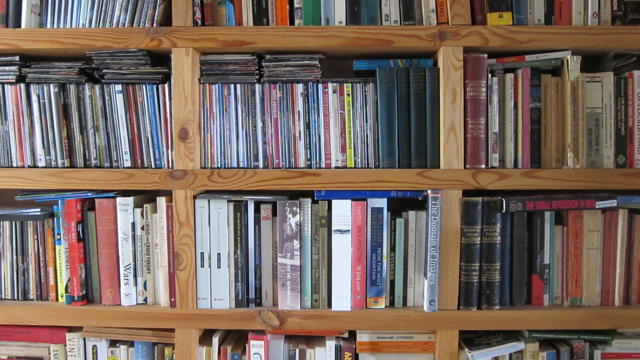 We wonder often how the projects are going that we leave behind. We can of course receive the odd update via email but its just not the same as seeing with our own eyes. Some of our permaculture blitz ideas were met with caution by our hosts, seen as “crazy” gardening or “cocktail” gardens. “Let’s see” was a common used phrase when a new experiment had been planted out. 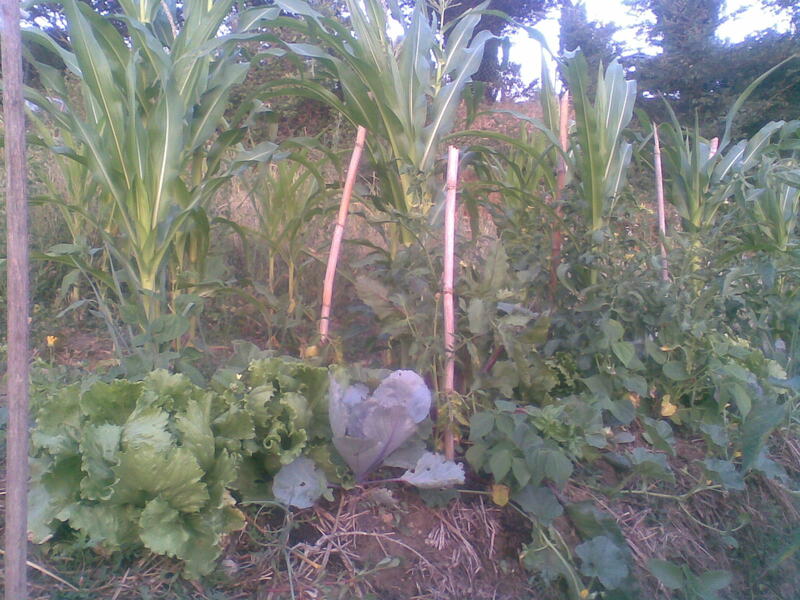 Luckily Giovanni was very open to the idea of a new synergistic garden, less work, less water, less disease, no chemicals, no digging, more food were all promised once the initial set up was complete. You can read the original blog post here. We have been in Italy for 6 weeks in total. 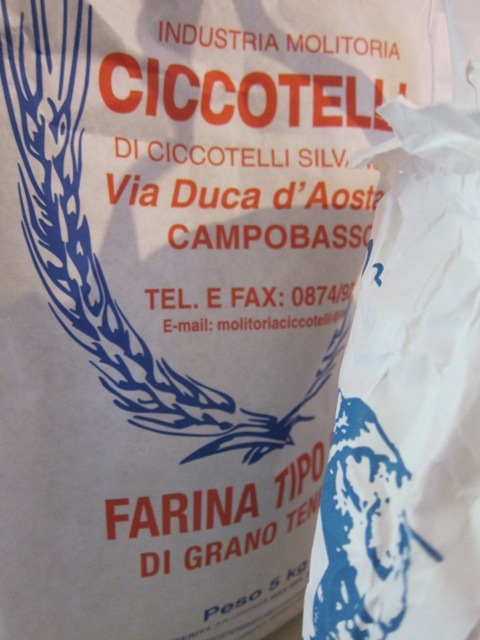 For each new person we meet or new village we enter we wonder if we’ll ever have a truly authentic Italian experience. 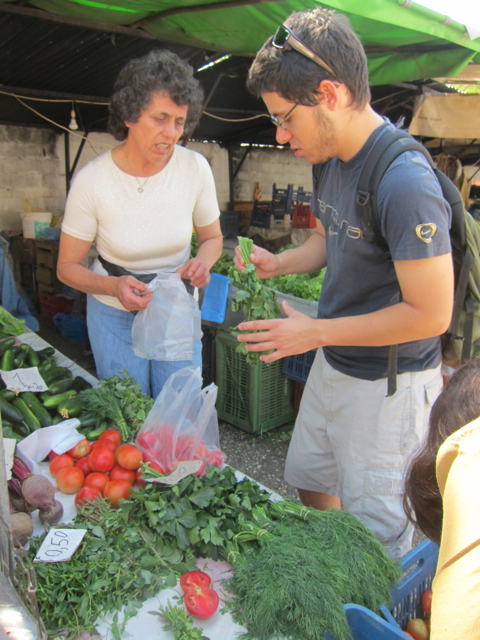 Some time with a family would be nice or the chance to learn about home cooked Italian food. 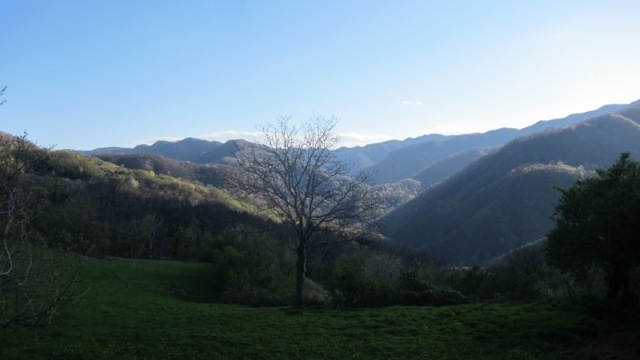 From the comfort of our Molise farmhouse we looked through the wwoof host list once again and although we usually steer clear of agri-tourism farms there was something wooing us towards our next host. It may have been the photo’s that Nina spotted of home made pasta and freshly baked wood oven bread. In fact I’m sure it was. 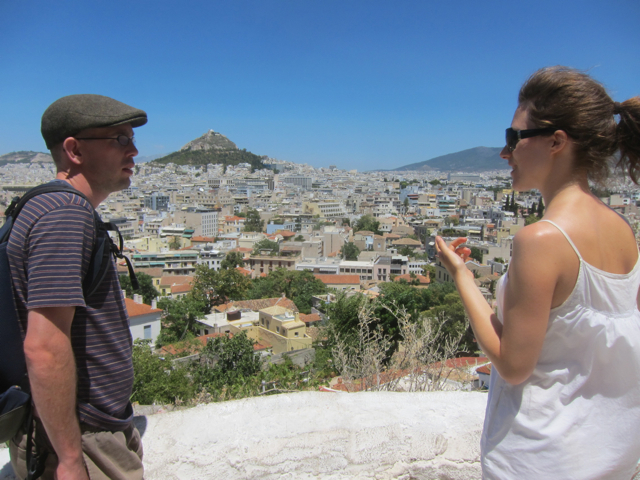 We contacted Giovanni and he was keen to have us for a week in Busso before we left Italy for Greece. Giovanni kindly collected us from our farmhouse in Faifoli. 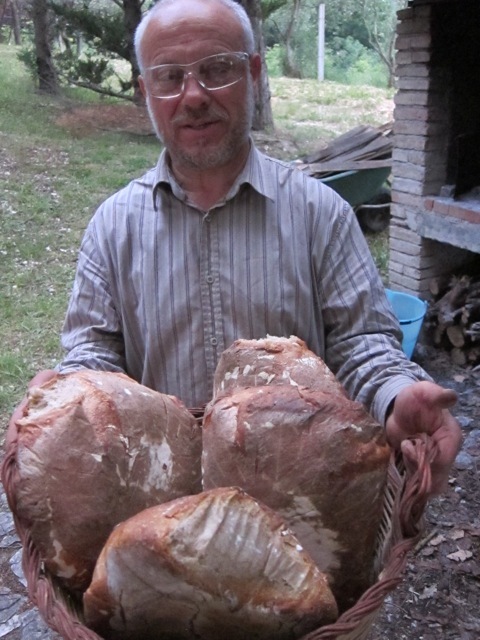 He has a friend with a mill nearby and was keen to pick up some fresh flour for baking and making polenta later in the week. He hinted on route that he was recently separated from his wife and it was obvious when we arrived at his house that the agri-tourism business had been laid to rest. 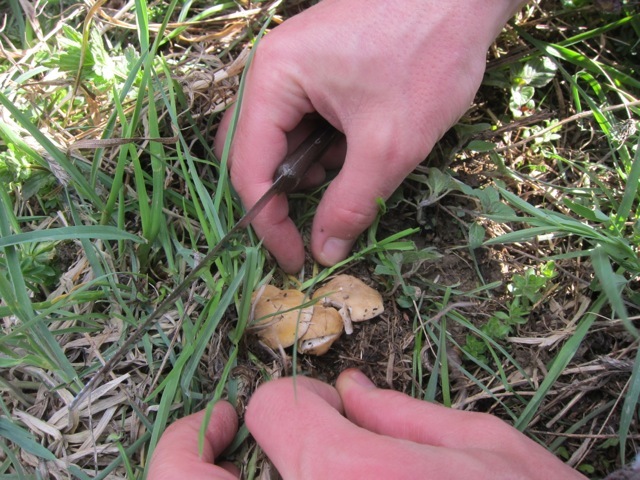 The topic of conversation in the car was verging on obsessive and Giovanni clearly had a new passion – truffle hunting! It turns out that we had arrived in one of the most prolific black truffle hotspots in Italy and THE only region in the world where you can find the elusive white truffle. Giovanni got up at 4am every morning to take two of his five dogs out hunting. He mentioned to us that he watches films or listens to music at around 2am each night and he was up past twelve every day that we were there. One day we found him randomly sleeping in his car at lunchtime and on day five he confessed to insomnia which gave reason to the silver-back nature we had experienced, calm and attentive one minute and explosive and unpredictable the next. We wanted authentic and we certainly got it. Our time in Busso was very testing but also very rewarding. Our host, also a professional chef, was keen to demonstrate his skills in the kitchen and we were baking sourdough bread and pizza within hours of arrival. He cooked pumpkin risotto, wild chicory, potato and bean pasta amongst an array of other Italian delights with home made wine with every lunchtime and evening meal. Oh yes, before you ask, we were treated to the legendary black truffles, once with egg and once with the polenta on a friendly visit to parents for lunch. There is no other taste like it in the world. Delicate fungi with a buttery warmth that when grated, raw, has a distinct texture similar to parmesan cheese. I could see how they could become addictive and maybe why Giovanni was obsessed and a bit crazy. 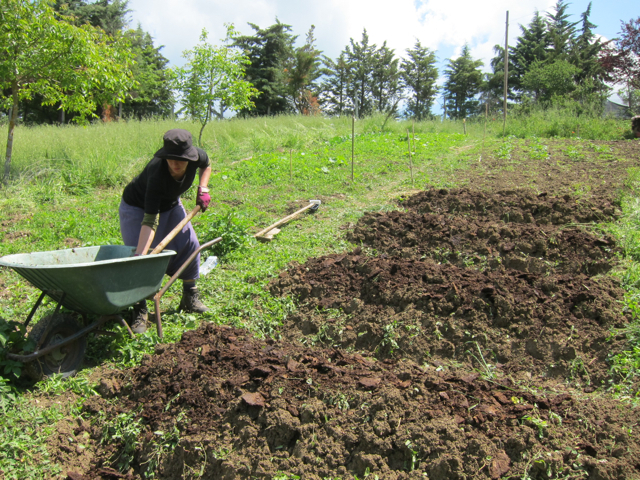 Our duties as wwoofers were mostly helping out around the place. We emptied a wood shed and added some new acacia uprights for roof support before re-stacking it, we put up some fencing, we helped move things around that he couldn’t have done alone, we supervised the revival of an old lawnmower and we generally kept the crazy-maker’s kitchen clean. 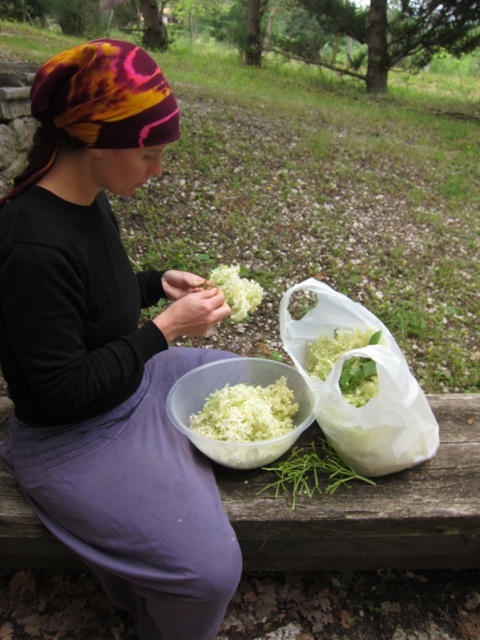 Plus we made another round of elderflower cordial, our third batch in Italy! 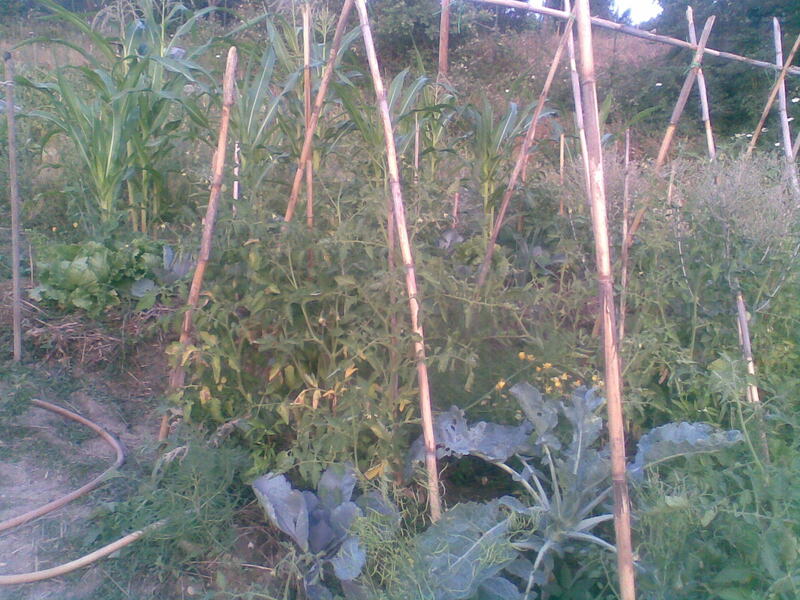 Giovanni mentioned a few times that he wanted to ‘do’ permaculture in his vegetable garden. 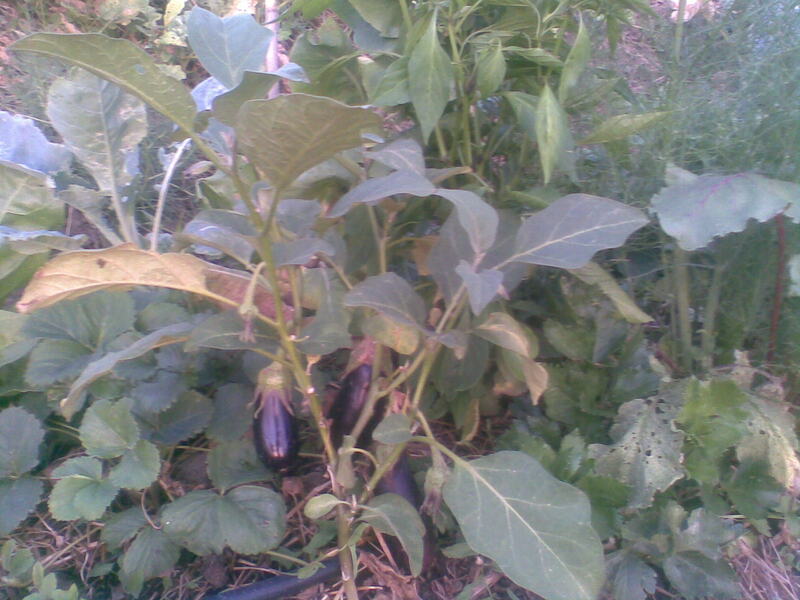 On day four he went out to visit a friend and Nina and I set about turning an unused area of his vegetable plot into a synergistic garden. I’d learnt the basics from Elena a few weeks earlier. 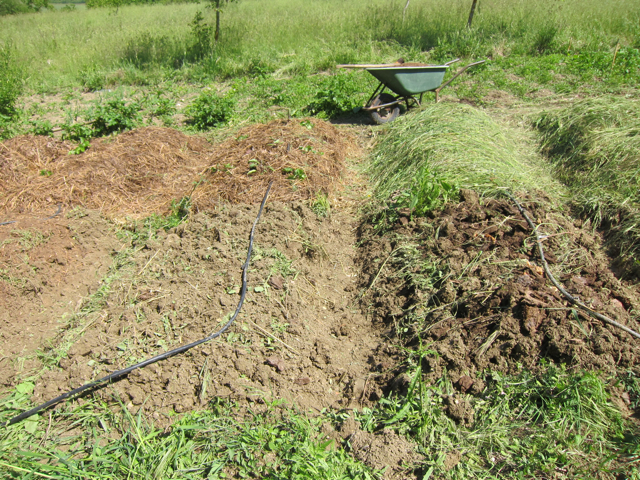 The process of setting it up is very easy and due to the no-dig nature it only has to be done once. On the slope I pulled earth from the high ground down to form one metre terraces, leaving a path. 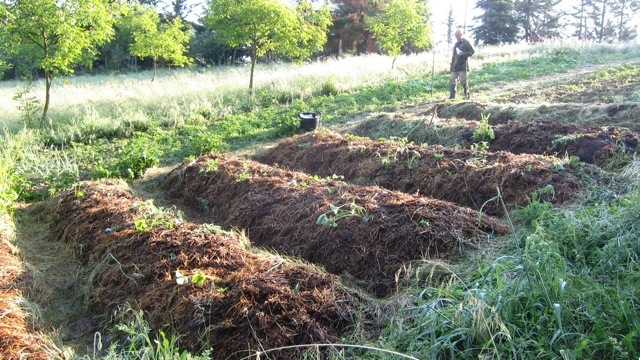 Nina added plenty of old sheep and rabbit poo and I then added a drip irrigation pipe along the top of each terrace and we heavily mulched, paths an all. 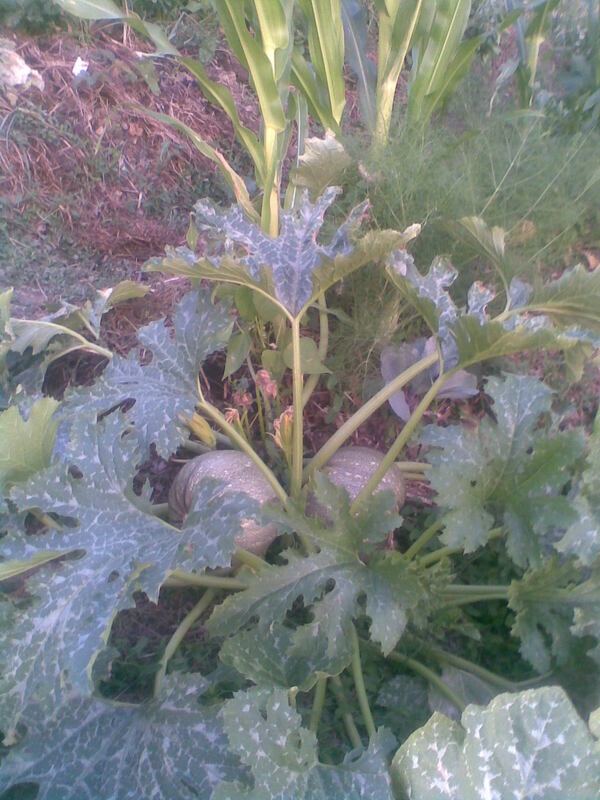 We had some seeds collected from our journey so far, some seedlings that Giovanni bought plus whatever we could find around the property, like strawberries and mint. 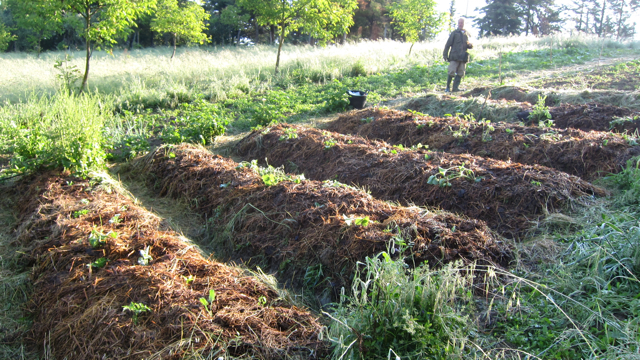 We designed a companion pattern for each bed and packed them full of food crop and beneficial plants like borage and calendula. 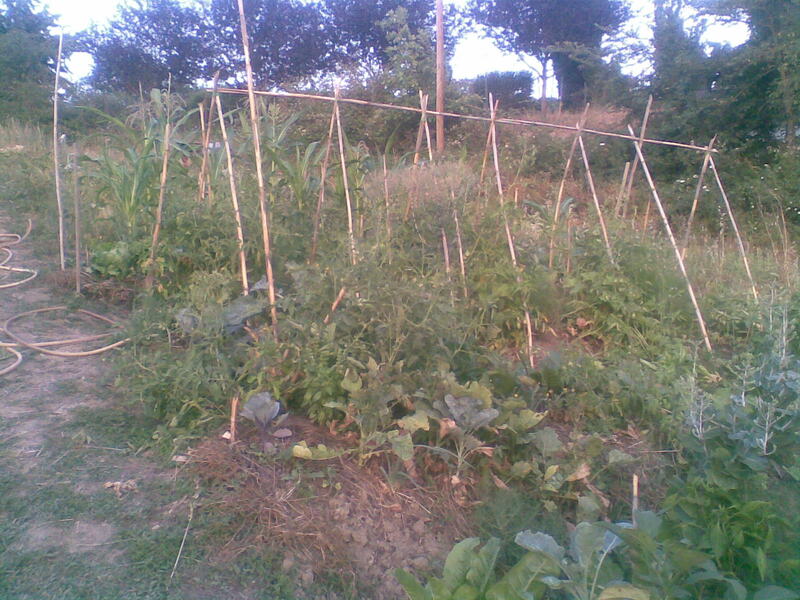 Giovanni was very happy with his new garden and said that he was hoping to transfer the whole veg patch into this type of ‘easy’ growing system. 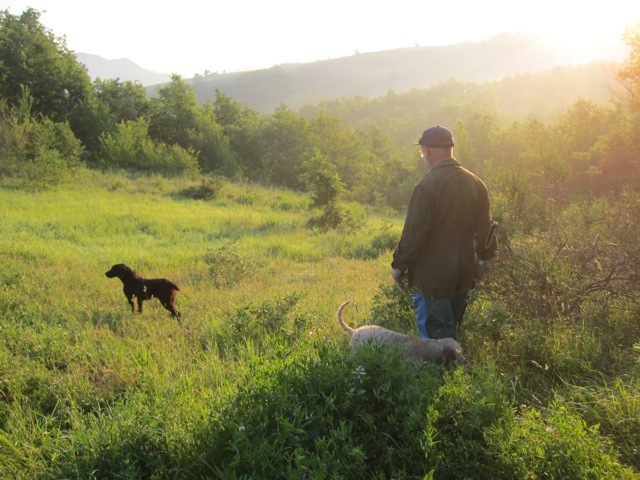 We were asked along to a morning truffle hunt one day. Up and out the door before 5am. Dew-proof trousers, a big stick and sniffer dogs in cages. It was all very surreal. We drove to an area just a few kilometres away, a young forest emerging from grassland. Oaks, blackthorn, wild apples, hawthorn, poplar and dogwood were all present. 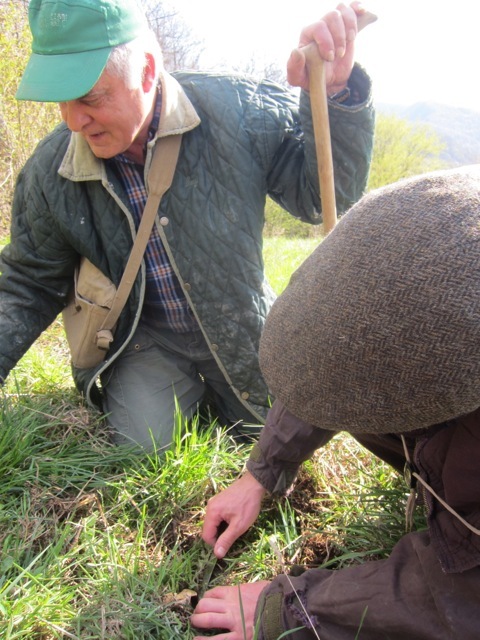 Giovanni showed us areas of grass die back where he expects to find truffles and sadly areas where some very competitive truffle hunters had dug up meters of soil around the tree. They do this once they have found just one truffle in the hope of randomly finding more. 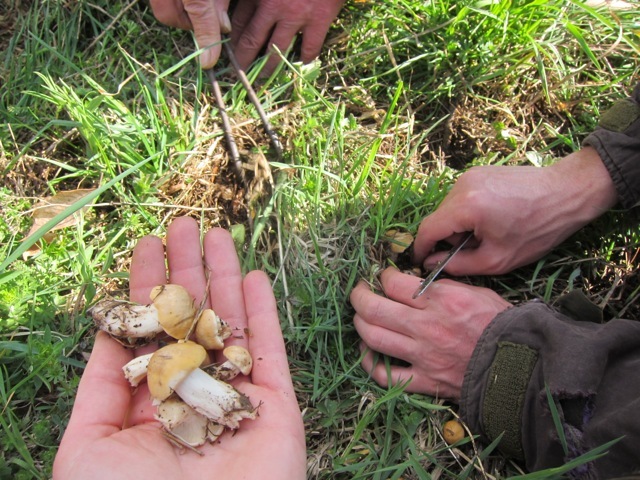 Not only do they take the unripe truffles but they break the mycellium and upset the symbiotic relationship of tree and truffle and any hopes of the same area fruiting again. Our guide has no need for this illegal type of scavenging as his dogs are so good at honing in to the spot. It was great to see them nose to ground, excited by what they may find. We didn’t find a truffle that morning. He never does when he takes people with him. We heard the horror stories of poison baits being left for dogs, easy for poachers to get the upper hand once your rival dog is dead. It’s big business and Giovanni has a friend who recently sold a truffle for $23,000. I was worried for Giovanni and I was worried for his animals. I could have counted the number of hours sleep he’d had in one week on one hand. One moment he was full of joy and enthusiasm for his new garden and the next he was whacking one of his hounds in frustration. 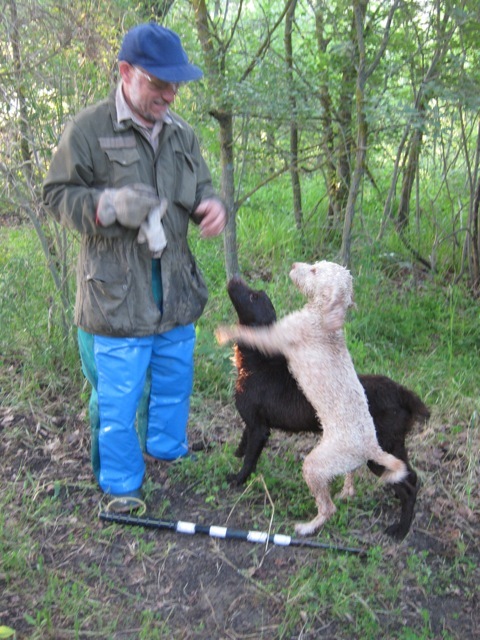 He was relying on truffles for an income and relying on his dogs for truffles. When little Ziggy got a wheat tuft in her ear it was the cost of removing it that seemed the major concern and not the welfare of the dog. I had to remind our host that the dogs had no water in their cages, cages that they spend every moment in when not truffle hunting. It makes me think about using animals as tools for profit related business. And it makes me think about relying on one stream of income and the pressure that comes with it. 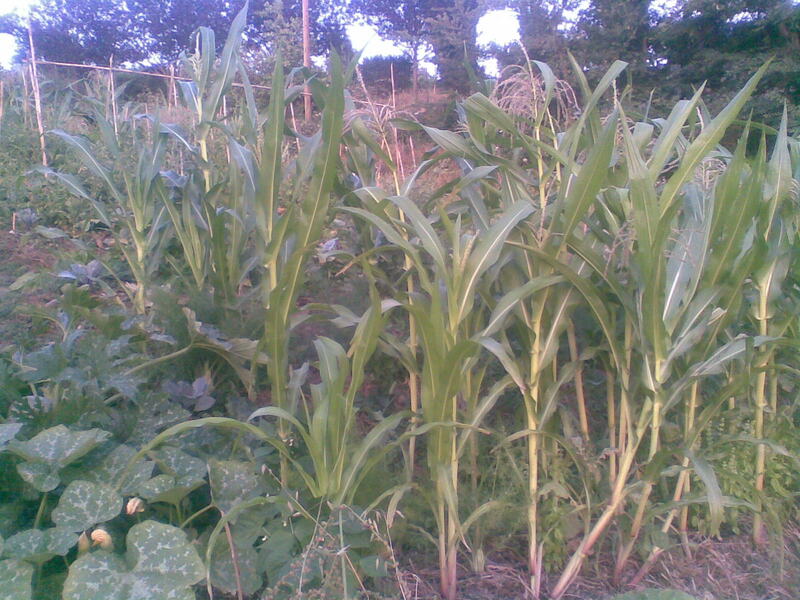 The permaculture principle of redundancy teaches us not to put all our eggs in one basket. The analogy of the spiders web demonstrates this perfectly, it can still perform it’s function even when a whole bunch of links are broken. I hope that Giovanni will be inspired by his new garden and maybe he will develop it further for less reliance on truffle hunting. After a really wonderful day in Venice with Ma and Pa we decided that an Italian countryside chill out was needed and hopped on a train south to Popolano, a small village inside the Tuscan region. The rain only enhanced the lush green vegetation amongst the rolling green hills. It was my first taste of the Italian countryside, I felt it soothing my soul, just what we needed! Hardly time to settle into our room before Giovanni our host knocked at the door with a big box of mushrooms. His father had been out that morning and hauled in a monster catch. We were invited to go foraging the next day if the weather was fine. A sunny day following a week of rain is perfect for the porcini at this time of year. The language barrier reared it’s ugly head once again and so we were not quite sure when or where we would go but at around 2pm we got a knock on the door and were ushered into a little 4×4 panda with Giovanni’s father Roberto and whisked of up into the mountains. Roberto obviously knew what he was doing and it felt like he was also passing his knowledge on to Giovanni as he pointed to different shades of green and distinct arches in the grass. They both had cool little rake-type-comb things. They showed us where to look and then got busy scratching around in the field. A very different technique than when Nina and I were wandering through the New Forest unable to miss the hundreds of mushrooms thrusting themselves towards us. We had to hunt hard for them and to make things harder someone had already been to this patch earlier in the day. We hunted around for a good couple of hours and found ourselves enough fungi for dinner. We were told that in another two weeks there would be many more mushrooms and they’d be bigger too. We were on the cusp of fungi season and so retired to our home for the evening eager to cook up our new found treats. Whilst in Barcelona Nina and I decided that we would meet my parents on their holiday in Venice for one day. I knew at that point that it was a crazy idea but they would appreciate a day together and it was the perfect excuse to get further east. 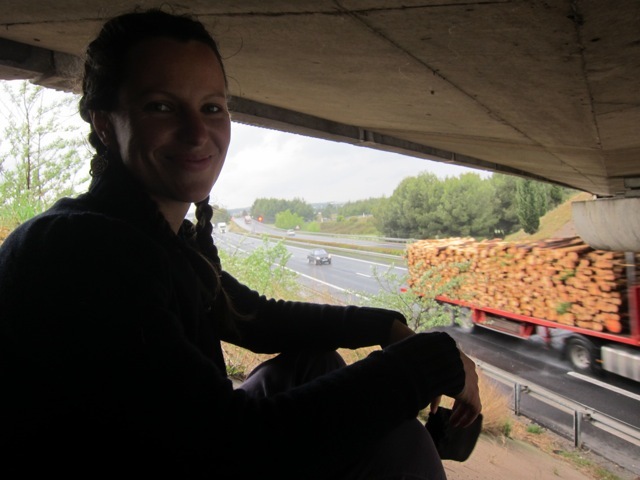 The only obstacle was 1200km and the expense of the train, boat and bus ride. 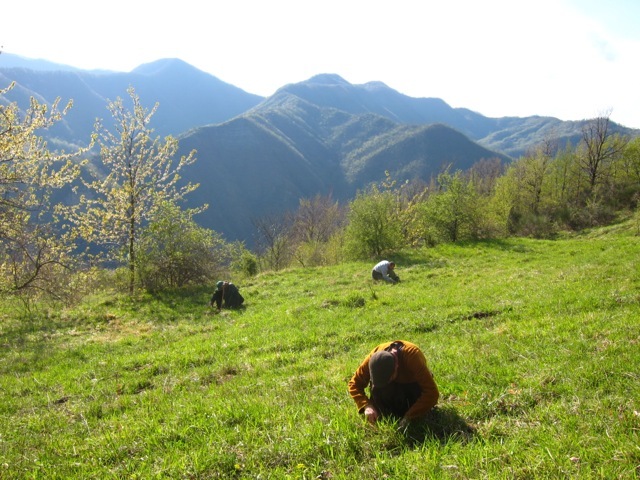 On leaving our wwoof in the Spanish Pyrenees we would have to cross two borders, through France and west to east of Italy. It seemed that the most economical way would be a four day hitch hike. We’d bought a tent in Spain and had a new sense of freedom. 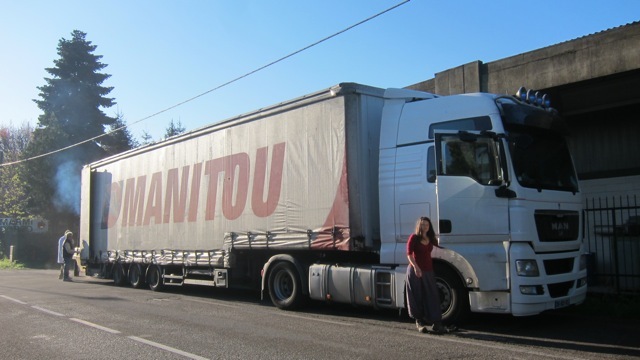 Amanda and Deno dropped us at a large petrol station near to Figueres, there were a lot of trucks, we were close to the start of the toll road into France. 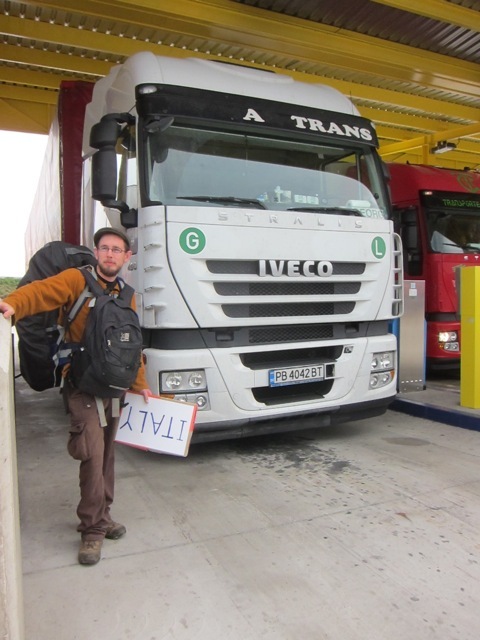 We checked out the number plates and soon realised that every other truck was either French, Italian, Bulgarian, Czech… We were in a good place to get east and so wrote out our “ITALY” sign and began to wait. We swapped sign holding every 10 minutes and after half an hour decided that talking to truckies in the petrol station might work better. Scouring the number plates and asking the easterly nationals “Italy? France?” we were soon greeted with an “OK”. The plate was Bulgarian and we were not too sure how far in that direction he was going but we hopped in and figured that part out on route. We’d hitched in Spain before but only an hour up the road each time. Now we were up high in a truck cab and probably for quite some time. We introduced ourselves and settled in to a journey with Jorge. He spoke no English, we spoke no Bulgarian but we soon worked out that he could take us as far as Nimes in France, an hour or so from Marseille. We were dropped at his turning off point, now starting to rain and not in an easy place to pick up another ride. We were on the highway and so started walking in search of another good spot to hitch from. We felt glad that we’d got 200km or so in the right direction but we were now a little stranded. Nobody flying past us could or would stop and maybe it was a little dangerous too. Within 15 minutes or so a highway repair truck pulled over and kindly offered to take us to a good hitching place. He dropped us at a toll. It seemed a little cheeky asking for a free ride in a place where people were paying for the road but we had no choice and so held up our “ITALY” sign once again. It seemed like nobody would stop here, not many trucks, no number plates for other countries and not that much eye contact either. Enter Ben! A french lad who lived up in the mountains. He pulled over, told us he was heading to Marseille and helped to put our packs in the back of his van. We were soon chatting about anaerobic digesters and composting techniques. He was a really nice guy and within an hour he was on the phone trying to fix us up a bed for the night at his friends in Marseille. He made several phone calls and while we waited for a reply we weighed up the possibility of camping on the outskirts of the city – not such a nice place to stay. We were beginning to realise that when hitch hiking we are at the mercy of our drivers. A little faith and a lot of luck later we were dropped at the door of Ben’s friend in the center of Marseille. 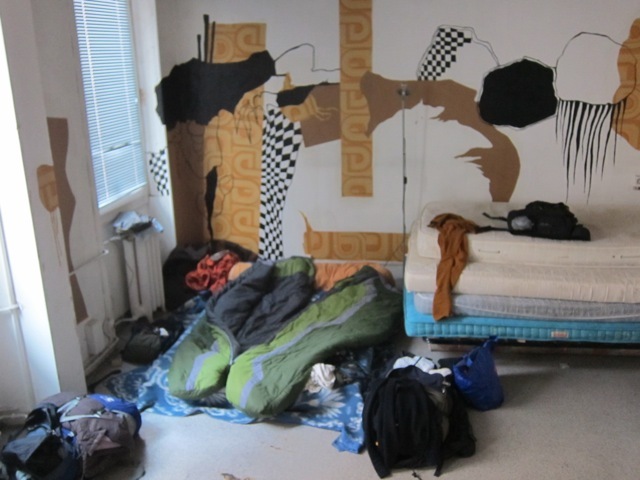 They welcomed us in, explained that it was a squat, apologised for the lack of electricity, showed us a room we could sleep in and then invited us to eat with them. We felt very fortunate that on such a rainy night we wouldn’t be erecting our tent in the dark! Day two of our voyage to Venice started with a little shopping trip in Marseille ready for the unknown road ahead. We had a coffee, grabbed bread, cheese and fruit and followed the advice from the squatters to hitch from the toll road again heading east out of town. The toll looked uninviting and there was no real place to stand for foot passengers. We were asked to move to a different area on the opposite pavement by security and it seemed unlikely that we could get picked up in our new invisible spot! To our surprise in a matter of minutes a mechanic from the airport pulled over in a minibus. He was heading to Toulon, an hour or so up the road. It was our first glimpse of the southern coast of France and we were relieved to be on the road again, this time heading towards Cannes. He dropped us a kilometre from a petrol station where we would find our next ride. On route to the petrol station, and now on foot, we spotted the fat sign of IKEA. Remembering that they had free internet we thought it was the perfect place to check our couchsurf requests for Venice. Next to IKEA was the next petrol station we would try our luck from and we didn’t wait more than 3 minutes before our next ride. A male couple leaving IKEA with their new kitchenware. They had just found a new apartment in Cannes and were moving there from Switzeland in a couple of months. We squeezed in the back and they took us as far as Cannes to yet another petrol station. This one had plenty of trucks and we were hoping that our next ride would be from up high in another cab. Enter Dimitri. We were sure when he rocked up in his monster truck that he was Italian. Our sign said “ITALY”, he looked Italian and he was going to Italy. We introduced ourselves, jumped in and asked where he was going. We would’ve been happy just to cross the border but it turns out he was going via Milano to Bologna, not all that far from Venice. Jackpot with a day to spare! Dimitri was a really nice guy, he was only 23 but had been driving his truck for a few years, he had a young family back on the west coast of France and thankfully his taste in music was pretty cool too. Crossing into Italy and for the rest of the evening we cruised along listening to reggae and asking questions about one another’s lives in broken english and french. By eight or nine that evening we realised that Dimitri’s trip via Milano was for a delivery and an overnight stop. 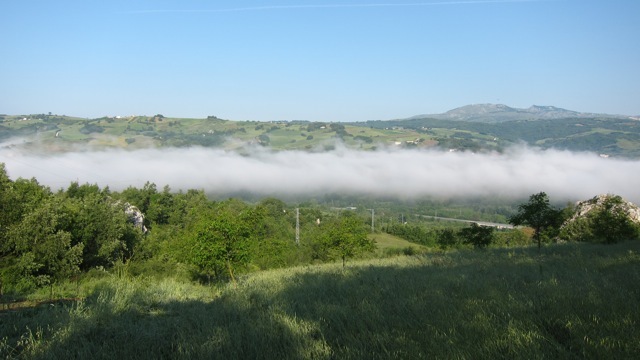 We were a bit worried about staying on the outskirts of the dodgy misty metropolis of the Italian north but our kind lift giver soon offered one of his bunks when he realised we would be camping. We arrived in Milano, parked up and disappeared into the mist for a pint of Leffe happy that we had come so far. The next morning we continued with Dimitri as far as Brescia where we said our goodbyes and started a new day and a new hitch. Well, so we thought. It turns out that the north of Italy is not used to hitch hikers and the lady at the petrol station had great determination in telling us not to hitch from her slip road or she would call the police. After some shoulder shrugging and nonchalance from me we decided to give her her way and moved on. We walked for some time towards the centre of Brescia where we saw the bold blue and yellow bricks of IKEA once again. We thought it to be a lucky charm and so crossed the motorway and entered the store. There is no free internet in Italy though and after a 1.99 pasta dish we stepped outside to try our luck at the leaving customers with no room in there cars. Yep. Silly idea at Ikea. A friendly member of staff soon picked us up though and we decided to get a train closer to Venice. Hitch hiking in Italy is hard and the trains are cheap. Next came our Youth Hostel in the charming city of Padua. It was our only option after our AirBNB and couch surf hosts fell through. We took full advantage though and spent the next day exploring the city on foot in the rain with a broken brolly we found. We called ahead to a couch surf host in Venice who said he was full but if we got desperate to call him. My parents were arriving in two days and if we were to be there to greet them at the port we had to go to Venice that evening. Slightly put off by the description on his profile, we were not quite sure what we were getting ourselves into by volunteering to stay with “Autonomass”. His name was Massimo and he lived in autonomy. 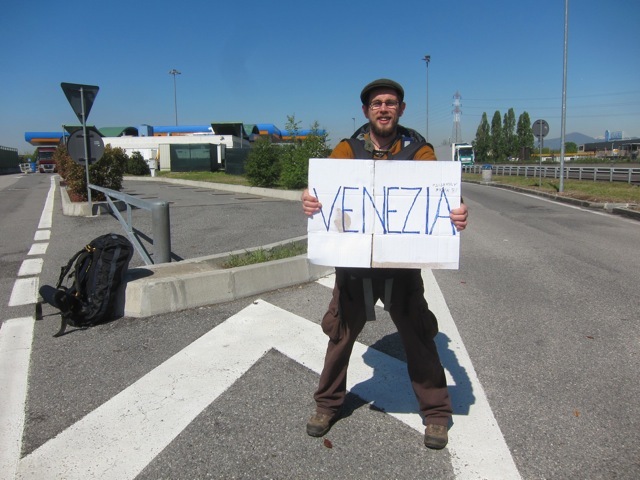 He greeted us at the station and was immediately keen to take us to a university building he and friends were squatting to be saved from sale by the skint Venetian municipality. That evening we heard the horror stories of Venice and the huge destructive problems of mass tourism. Apart from the palaces that are being sold off to make way for hotels, the second most visited city in the world is suffering from the 3 million or so tourists that flock in every month. 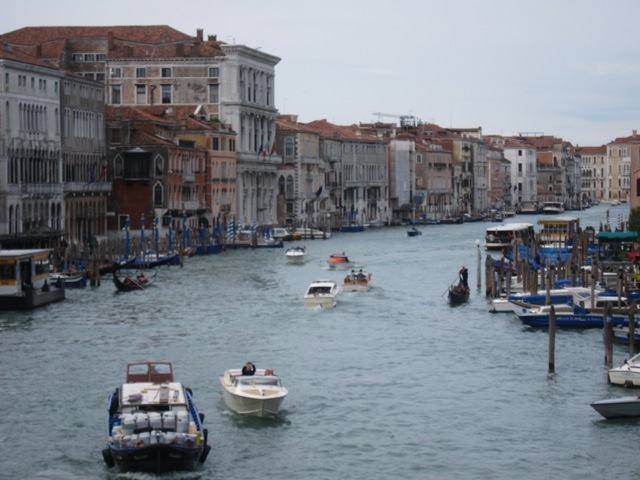 Yes it’s true that Venice is sinking, we saw it for ourselves. So Massimo’s main objective is to protest against the tourism industry. All the facts were undeniable. They were having a catastrophic effect on the city. It’s becoming a museum, and as the prices rise the locals leave. He was here to stay and with the help of the rest of the activist army they would be staging a protest on the water the following day. They will be in boats, about 100 of them with a sound system, tekno and fireworks. The main target – the Queen Victoria cruise ship. Yes, the one my mum and dad will be arriving on for our day together in Venice.